Artful Affirmations: Happy June Giveaway!!! Oh what a special giveaway. I've never seen a matchbox used in this way -- or filled with such deliciousness. please count me in I am a follower love your work and ideas. Hope this posts, I too have had trouble with blogger. Such a fabulous way to kick off the month of June! Your matchbox is so beautiful! 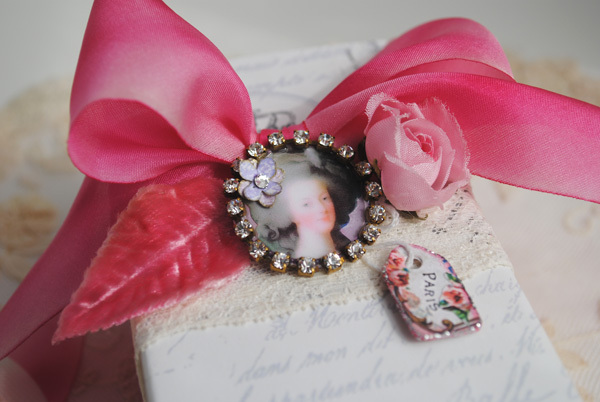 Oh, yes, I would love a chance to win this absolutely beautiful Marie matchbox!! Sweet box, nice giveaway~ Happy June! The box is gorgeous! I had one problem posting images on blogger. It cleared up. But I've heard about so many problems everybody is having that I'm beginning to worry. I know you couldn't post a comment on my blog. Hopefully, blogger will work everything out because my computer knowledge is limited! Love your creation! Love all of your stuff...great talented woman! Count me in for the giveaway...would be honored to win! WOW, yest enter me please, thanks for the pretty giveaway. Oh, that pink leaf is simply superb. Your matchbox is absolutely beautiful. how very lovely I would love to be entered in to win this. luv , luv, luv, that matchbox it is just so pretty! What a beautiful give away. You are wonderful! Please count me in. I always love reading your blog. I'm a new follower, and I'm so happy to have found you by way of BlissAngels. I stopped by to read your paper shoe tutorial and was amazed by your giveaways for the month of June. The first is not only beautiful, but you are so kind to hold one a week! Count me in...I'll be visiting often, and not just in June! That is very sweet of you to offer so many giveaway's for the month of June. Please enter my name. I think altered matchboxes are just darling. This is precious. Please enter me as well. trshamp@gmail.com. Thanks! What a lovely give away, please include me. A sweet Giveaway.Many thanks for the opportunity to win some of your Lovelies! Hi Terri-I would so love to win your adorable altered matchbox. Thank you for the chance. Count me in the giveaway. I very much want to win a box! Completely irresistible, Terri, thank you so much for offering such a gorgeous altered matchbox filled with pretties. I am keeping my fingers crossed. How beautiful and delicate!!! Such a wonderful gift. Beautiful, Terri. I just love Marie! Thanks for the opportunity to win!! please enter me too! Love your lovely-ness! Have a sweet happy June! Terrie- what a sweet give away! Please enter me into your drawing. I'm going to have to try to make some of those boxes... are they the large match boxes? Any pointers? You amaze me - multi talented lady! Well count me in on this one. I will have my fingers crossed! What a sweet box. It is so beautiful, so special. I'd love the chance to win it. your matchbox is delicious with your beautiful touch. Always remember: You're always the best! really really sweet match box! Wow I love this little box, thanks for the chance to win and I will be looking forward to what else is to come. HI TERRI...you are so very generous indeed! What fun...a Month long of giveaways! Only you could think of that! I adore your artful creations, and am so inspired each and every time I visit here and lay my retina's on them! I would so badly love to win something of yours. It would be my pleasure to display it here in my home along with my personal creations! Please do enter me to win! Oooooh! What a sweet giveaway! Terri, your matchbox is beautiful...love the sweet Marie charm. What a lovely giveaway! I love seeing all the creative things you do and following along with your tutorials!! I just found your blog and love it!! This give away is soo beautiful, and that vibrant pink is my very favorite color! I´m a follower for a while now and so glad I am. I would very much like to be included in the drawing. I want this soo bad, I love it! pretty...pretty....pretty...please count me in. I'm a follower already. BTW I love what you have on your sidebar claiming "joy is my compass". What a lovely idea! It would be a dream to win this gorgeous box:-) Can't wait for the new tutorial!!! Thanks so much, Terri! what a gorgeous giveaway! I would love to have my name included in your drawing! Happy June! Wow, Terri !What a great way to make for a shiny June ! This box is gorgeous ! I actually have a dear friend who is a huge Marie fan and if I win, I will pass the Love onto to her to brighten up her month too! Wow, love your post, it is beautiful. I am just getting back to people now because of the Blogger issues. But thank you for stopping by my blog. Count me in on your beautiful giveaway, so pretty!!! Wow! This is beautiful! I'd love to win any of your pieces. I would love to receive this lovely matchbox. Thank you for sharing your creativity, it inspires me to try. Oooh! So pretty and artistic! I just started reading your blog, and I've really enjoyed it thus far! So glad for the chance to win this lovely box! What a sweet and generous giveaway, Terri! The matchbox is just so lovely! Oh this is so beautiful. Please count me in for a chance to win also. Thanks! Oh Terri It is Soooooo beyond scrumptious!! Please toss my name in your giveaway hat!! You put my giveaway to shame!! What a gorgeous giveaway! Perfect pink in every way. Hope you're having a wonderful day. It would be fantastic to win one of your beautiful Antoinette creations! Count me in, Terri! So beautiful. What a wonderful match box giveaway. They are so lovely and dainty. I would of never thought of using them in such a beautiful way. My granddaughter loves little things like that. I will have to show her yours! Please enter me in the fun giveaway , thank you. Wow what a wonderful give away. It's even my favorite color - pink! Wonderful. And a give away each week. That's so kind of you. Thank you! Ohhhh! What a lovely box of treats. What a perfectly pretty giveaway! And, O, what fun! You always make such beautiful things. Surely this is a great way to have a fantastic June. Love your blog! Count me in for your giveaway. Another gorgeous creation Terri! What a delight it would be to receive. Please count me in on this one. Love all of your art work and would love to be added to your giveaway. I had a long blog break but am back trying to catch up with everything. Love your stuff! You've inspired me to make a Faery School too! Would love to win one of your giveaways! Terri- This is fabulous.. Your matchbox is so sweet. It does feel good to give doesn't it? I'd love for you to stop into my new event. Very sweet little matchbox, Terri! Would love to win it. I am a follower. Thanks. What a beautiful giveaway. First time to visit and I get this chance to win. Thanks for sharing. your box is wonderful, and sweet,I love Marie Antoinette- and all the pink . Double yeah, blogger let me comment and you're having a sweet giveaway!!!! This would be a lovely addition to my altered matchbox collection!!! God luck to all and thanks for giving away such a lovely gift!!! What fun it would be to win such a pretty prize! Oh boy! Oh boy! Please count me in too!!! Thanks a lot! Your Marie matchbox is great - so pretty and feminine. I love the brooch and little Paris charm, and the pretty contents. Yes, please. Pretty please. With sugar on top! Enter me into your drawing. BTW, I haven't seen so many comments for one give-a-way before! Congrats. Thank you for visiting my blog. I can hardly wait for the Mad Tea Party too! This will be my first year to participate. I will be having a giveaway during the tea party. Please enter me in your sweet giveaway. Please count me in too, Terri. It's just beautiful! Thank you for the chance. And Happy June to you. I would love to win your gorgeous matchbox! Thanks for a chance! Yeah, blogger is finally letting me leave comments!!! Have been drooling over your gorgeous giveaways for a while now. What a beautiful thing you have made. It is like a glimpse into another time and place. I would love to go there...Thanks offering to share this with someone! What a gorgeous creation of yours! Please enter me in your giveaway. I'm new to your blog and so impressed. Would love to be a winner of your giveaway! My new found love is shabby chic/vintage and when I found your blog I was so excited and am now a follower. 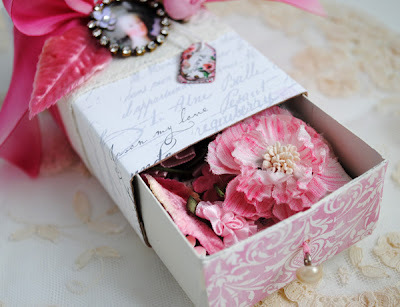 Your matchbox is gorgeous as are all the other amazing creations I saw throughout your blog. Your work is stunning and so inspiring! Your box is beautiful. Please count me in your drawing. Your matchbox is beautiful and I would love to be entered in your giveaway. I alwasy enjoy my visits to your blog. Thanks for all of your inspiration. Oh what Joy your blog is I love coming and looking at everything you do. What pleasure you give. To have something of yours would be a dream come true..
How beautiful!!!! I love your gorgeous box! Yes, please I would LOVE to enter. Thank you for offering it. 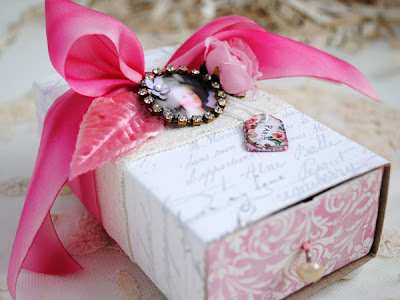 Your little box is so pretty and finding all the treasures inside could be so much fun! I really appreciate the opportunity to win this! I have been a follower of yours for a long time! I honestly am not sure if I signed up for this but I love it!!! Lovely. Hope I'm not too late to be entered. wow what a fabulous marie style box.... terri everything you make is soo lovely.. Your matchbox is just beautiful! Actually, your whole blog is beautiful!! Thank you so much for a chance to win!! please sign me up for this lovely giveaway.. and thanks so much for being so generous. what a wonderfull blog you have and what beautifull things you make... bit speachless :) count me in for your give-away :) and you defintely have a new follower as well! happy june! Oh! Please, yes!, I would love this very special gift filled with delightful treasures and trinkets. A magpie's paraphernalia, right up my alley. Thanks for the chance to win all the goodies. Ah! A little box full of possibilities! Oh how gorgeous! Please enter my name. I am a follower. I follow your blog and have no idea how I missed all of these posts!! Ohhh, this matchbox filled with Marie treasures is beautiful!!! Thank you for the oppportunity to win! Oh Terri. I've just left your mad hatter tea party and was as delighted at "attending" a party as I've ever been in my life !! Your writing creativity comes across as if I was there...but yet longing to be there. I thank you so very much !! Sign me up - you certainly are so giving! And so creative! I can be reached thru my blog. Perhaps you'll find it appealing enough to stop by now and again. Pink Ribbons! please please count me in! hello just found your page and love the tissue paper transfer video! What a great idea. Your June giveaways are fantastic please add my name to the list. Hello Terri...i love all your things what you make...but this marie Matchbox ooolala, so cute !!! Such a lovely tea party and such a lovely giveaway. My eyes are smiling :) Thank you for sharing and I am crossing my fingers and toes! I've decided to follow your lovely blog not only for the giveaway, but your tea cups make me happy!